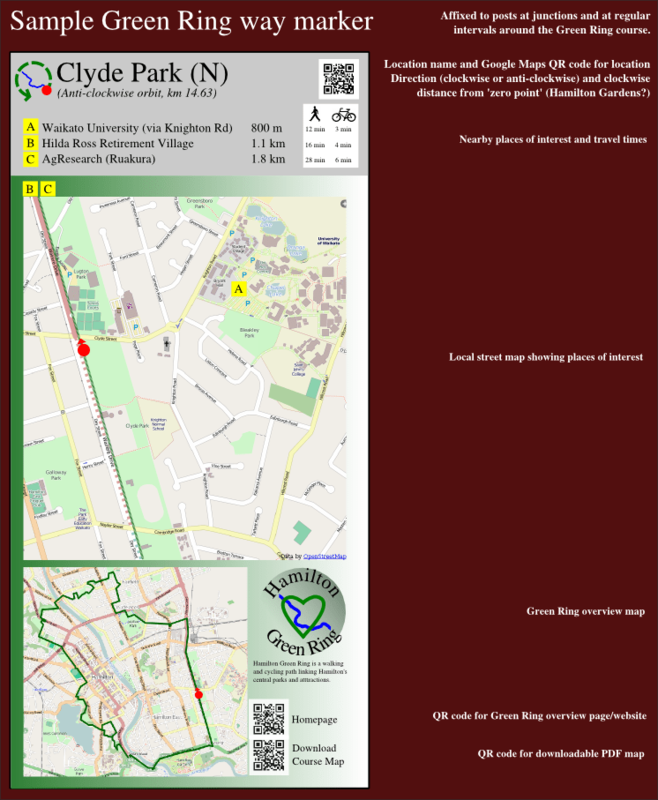 Hamilton Green Ring is a project initiated by Hamilton Urban Blog to link the various parks comprising Hamilton’s historic town belt, providing an off-road route for walkers and cyclists and a recreational resource par excellence. Thanks to the fact that the Green Ring uses existing sealed paths for most of its length, and runs through some 22 of Hamilton’s parks, there are already existing ‘feeder paths’ from many suburban streets. With the addition of a few markers and destination signposts, the city has an almost ready-made sustainable transport ring! We are asking that the Hamilton City Council provide assistance with installing markers and signposts, lay a path along the few hundred metres not already sealed and provide some safety improvements at several road crossings crucial to the route – we believe the city has a massive untapped recreational, tourism and sustainable transport resource in the form of the Green Ring! Of course, the path isn’t intended to serve only as a loop/circuit. Like the Hamilton Ring Road project, people will ‘hop on’, travel some distance and then ‘hop off’ near their destination with minimal interaction with motor vehicles required. Detailed signposting showing distances and times to nearby points of interest for both walking and cycling will encourage everyday use of the path for both tourists and the many thousands of Hamilton residents who live and work in its direct vicinity. The below interactive map shows a provisional course in green, with some possible alternate routes for consideration in other colours. Zoom in and out and click the markers at various locations around the route to show photos of important sections. Here’s a mock-up of a way marker that might be typical around the course. It shows local streets, local places of interest, course overview map, etc. A sample way marker showing features. As somebody who walks daily to and from the CBD from May Street through Greensboro Park I appreciate the newly laid concrete path here. A similar path through Lugton park from Ford St. past the In line skating pavilion and tennis pavilion,already partly paved would also be appreciated. My alternative route, even more direct, through Hamilton Boy’s High Grounds would also benefit a paved pathway thus giving an almost straight walk into town from the university, encouraging students to walk, skate or cycle. Been pushing for a Sydney Green Ring (http://www.sydneygreenring.org) since 2008. Many people are enthused only there are so many local governments involved and the intractable Sydney Airports Corporation Ltd. Good luck with your project would be great to see it get up as proof of the latent and realised desire. The roundabout at Founders Theatre would go well with raised entry points so Bicyclist are made safer to ride around.